Home > Law Books > Treatises > Georgia Trusts and Trustees, 2018-2019 ed. 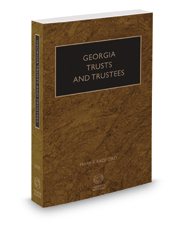 Georgia Trusts and Trustees, 2018-2019 ed. Georgia Trusts and Trustees provides complete guidance for persons acting as trustees in Georgia. While the content is structured around the 2010 Georgia Trust Code, a full understanding of that code is only possible within the context of the many laws and rules that preceded it and the developments in other states that prompted the revision of Georgia's Code. A variety of uniform laws greatly influenced the development of Georgia's latest codification and these are also discussed where relevant.